There are many people out there that have lost teeth. Missing teeth can unfortunately affect the aesthetic of your smile and change how you feel about yourself. Missing teeth can also make it difficult to chew certain things, which can significantly restrict your life. If you are currently struggling with missing teeth, you will need to visit your local Saratoga cosmetic dentist. At Joshua Colkmire Restorative and Cosmetic Dentistry, our staff can educate you on your implant and denture alternatives. You don’t need to live your life with missing teeth, instead, contact and schedule and appointment. In this blog, we will discuss some of your options at our dental practice. We will give you a run-through of the different cosmetic procedures available. More importantly, this blog will be able to give you some information about the positive and negative aspects of each option. We do this in the hopes that you find the solution that is right for you. A dental implant is an artificial tooth root that in placed into your jaw. Your jaw offer maximum support for the the replacement tooth or bridge. Many times, people will need either single tooth replacements or multiple tooth bridges due to periodontal disease. Implants are far more common for people that are older in age. However, this does not mean that it is unusual to have a younger person that needs a tooth replacement. Missing teeth or misshapen teeth can also benefit from a tooth implant. It is important to note, that if you have a one missing tooth, you have the option of choosing a dental implant or a dental crown. Both are great options for the aesthetic of your smile. However, if you have multiple missing teeth, you may want to research dental bridges or dentures. To determine whether you want dental implants, you need to know what procedures there are and how they differ from each other. For instance, there are two types of dental implants: endosteal and subperiosteal. These differ by where they are placed on your jawbone. Endosteal implants are when the artificial root of the tooth is drilled into the jawbone. Endosteal is the most common type of implant and requires your dentist to surgically fasten the root into the bone. This approach to fastening the implant in your mouth is a great alternative for people with multiple teeth missing. For instance, people who have bridges, or multiple missing teeth, could benefit from endosteal implants. Why? Since the implant in attached to your jawbone, there is far more strength and support for multiple teeth. The second alternative is subperiosteal implants, which is fastened to the bone of the jaw. This will typically involve a metal framework that is attached to the bone, but not in it. Subperiosteal implants are popular among people who cannot use conventional dentures or have minimal jawbone height. There are many benefits to dental implants, but the most important aspect is that it is permanent. Many people with dentures have often complained that keeping their dentures in their mouth and clean is a struggle. Both subperiosteal and endosteal are effective ways for keeping your implants secured and safe. With permanent implants, you will not have to worry about your implants slipping or becoming detached. Instead, you can simply pretend that you never received implants and that the false teeth we have given you, are your natural teeth. 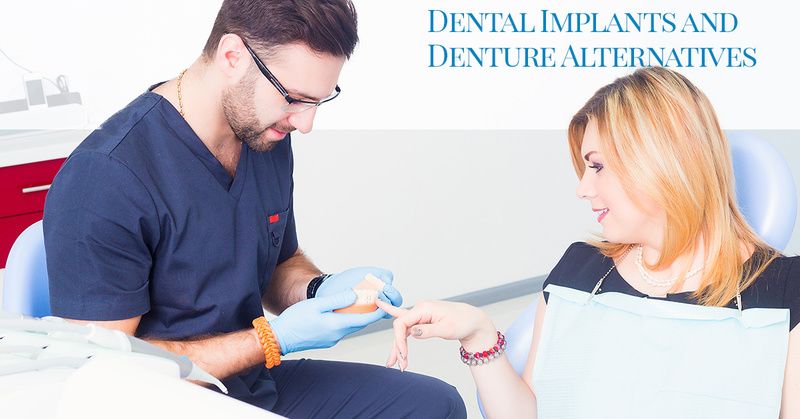 Many choose a permanent dental implant option for the pure convenience of the procedure of it. However, because this procedure requires multiple visits and oral surgery, some steer clear of it. Also, dental implants aren’t an immediate procedure. First, you must book an appointment with your cosmetic dentist and discuss your options. Your cosmetic dentist must determine that you are a good candidate for the procedure before you can receive your implants. Unfortunately, if you are in poor health, you can be denied to receive the procedure. If you are denied the dental implants, however, all is not lost. There are other options that can better suit your needs. Dentures and overdentures are other alternatives that are available. Dentures are great for people with multiple missing teeth. But, if you are worried that your dentures will resemble those of your grandmother — think again. The technology of dentures has developed over the years, creating newer, better ways to secure false teeth. You may remember your grandma complaining about your dentures falling out or moving around in her mouth. Today, there is technology that anchor the dentures to your mouth so they won’t slip. This makes dentures a far more enjoyable option for most people looking for cosmetic prosthetics. Another option available to patients of Joshua Colkmire are offered overdentures. Overdentures are a new innovation in the world of modern dentistry that is really shaking things up. Overdentures are a new form of traditional dentures, but provide some intriguing benefits. For instance, overdentures have been proven to improve speech and dental function. Classic dentures can sometimes cause issues with speech, which make their wearer sound drowned out or muffled. With overdentures, the prosthetic teeth are fastened in a more secure way that improves dictation. Also, it has been claimed that overdentures improve chewing capabilities. With most dentures, wearers will have to remove them before every meal. With overdentures, you can chew some types of food and chew more thoroughly. This can aid with digestion and make the wearer feel like their dentures don’t inhibit their natural behaviors. At Joshua Colkmire, our practice has both dentures and overdentures to provide our customers more dental options. If you are more curious about the overdenture option, contact our practice to speak with a representative. At our practice, we offer a range of cosmetic dental options for our clients. It is our hope that by providing many different options, you can find an option that fits your needs. For example, a denture piece may not be a great option for everyone with missing teeth. If you are curious about your options, or whether you are a candidate, contact our office today. We can schedule an appointment to examine the state of your teeth and determine which option is right for you, together. Call now!